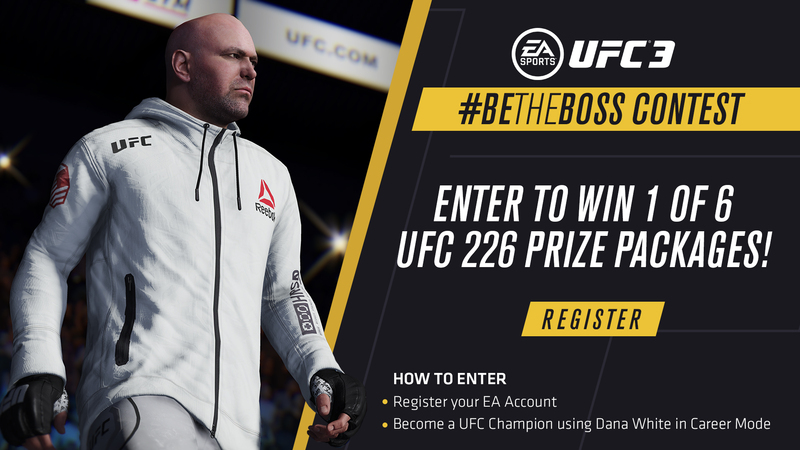 Las Vegas – UFC® and EA SPORTS™ today announced the launch of the first-ever #BeTheBoss contest with EA SPORTS™ UFC® 3, where six prize winners will receive the ultimate UFC prize pack that includes a trip to the highly-anticipated UFC® 226: MIOCIC vs. CORMIER on Saturday, July 7 at T-Mobile Arena in Las Vegas. Contest entry begins today and concludes on Wednesday, June 6 at 11:59 p.m. PT. To enter the contest, players must complete an official entry form by visiting the #BeTheBoss Contest Website. Contestants will then start Career Mode, selecting UFC President Dana White as their playable character and compete through their respective weight class with the goal of becoming a champion. At the conclusion of the contest, six winners will be chosen to win an all-expenses paid trip to UFC 226 to experience UFC like never before! One of the six winners will be upgraded to stand on-stage with Dana at the UFC 226 weigh-ins, tickets to sit in Dana’s personal section during the event and a reserved seat Octagon-side with Dana for the main event superfight between UFC heavyweight champion Stipe Miocic and UFC light heavyweight champion Daniel Cormier. The grand prize winner will also receive a private tour of UFC’s global headquarters and the UFC Performance Institute, along with a chance to play EA SPORTS UFC 3 with Dana himself. All winners will receive two tickets to UFC 226, reserved seats at the UFC 226 weigh-ins, a $500 UFC store gift card and a $1,500 Visa gift card. One winner from the UK/Ireland and five winners from USA/Canada will be announced around June 14, 2018. The estimated prize pack value is approximately $7,000 for North American winners and $8,500 for the international selection. The contest is open to legal residents of Canada (excluding Quebec), United Kingdom, Republic of Ireland, and the United States (including the District of Columbia and excluding Florida and New York).